Scientific clinical studies for Glycolic Acid have actually proven results that have been very difficult to prove for other skin-care products. Glycolic Acid from sugar cane (said to be the most effective of the various alpha hydroxyacids), does stimulate and smooth skin, induce exfoliation and increase the rate at which new, younger cells reach the skin surface. Dermatologists, scientists and skin-care clinics have reported that these features can improve skin texture and clarity; reduce the look of fine lines or wrinkles; help fade age spots or skin discoloration (particularly when used under a skin-lightening cream); help clear, brighten the complexion and improve skin tone. You won't believe how soft this cleanser will make your skin feel, until you try it. Use morning and night with a 1-2 minute massage action. Removes makeup as well as deep cleans with mild exfoliation. Has no fatty acids or oils common to other cleansers that could interfere with glycolic action. A special toner that gives the normal toner properties of extra cleaning and perfect pH balance PLUS Glycolic's benefits for smoother fresher-looking skin.This unique formula is super-saturated with soothing anti-irritants (aloe vera gel, hyaluronic acid & allantoin) to avoid unpleasant stinging. Use our Glycolic Toner after the Glycolic Cleanser. This is the original cream that won raves from users as well as skin care professionals-and established Reviva Labs as a leader in the glycolic acid field. Reviva's advanced formula links glycolic acid molecules into polymersstrands similar to the skin's own structure. Thus, there is maximum interaction with the skin to improve texture and help fight sun damage. Also, since the glycolic molecule is smaller than those of the other alpha hydroxy acids, it is absorbed more easily; an important factor in performance. stinging action, you can apply a light moisturizer or night cream over it. After a month, you can also use the cream in the morning under your daytime moisturizer, or alternate with other creams. Just apply this cream lightly and wait a minute, then apply moisturizer. Glycolic Acid Polymer-The advanced glycolic. Glycolic Acid Polymer means strands of gycolic acid similar to skin's own polymer (rather than loose glycolic acid molecules). Thus, for the oily skin it means beautiful epidermal interaction that does more than standard glycolics or AHA's as it helps improve skin texture. Also protects skin from pollutants during the day and fights excess oil secretion. You'll feel it's unique texture with your first application. Regular use has been reported to not only help resolve current blemish problems, but to help avoid future breakouts. Also, it removes the "oil-slick" caused by sebum accumulation. New skin-cells can now emerge giving skin a smooth, supple feel and blemish-free radiant glow. 10% Glycolic Acid Cream is for skin that has become conditioned to our 5% Glycolic Acid Cream first. Its high-potency action exfoliates faster...and offers fine texturizing benefits for aging, sun-damaged or blemished skin. Directions: Use at night. Start by using 3 nights/week until skin becomes adjusted to the higher glycolic percentage. (if you feel a strong stinging action, you can apply a light moisturizer or night cream over it). Note: We recommend "patch" testing for sensitivity on underside of forearm before beginning treatment with this cream. This new gel adds Glycolic Acid to our special blending of Hydroquinone (the lightening ingredient) so that the latter is absorbed deeper. 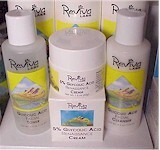 What's more, Glycolic Acid helps lighten by itself and blended with allantoin and aloe vera helps improve skin texture. Oily skin in particular will prefer this light gel but all skin types can see improved results by alternating our new Gel with our regular Brown Spot Night Cream and supplementing with our sun-protective and exfoliation recommendations. This page, and all contents, are Copyright (C) 1998 All rights Reserved. Revised: December 05, 2004.